Heavy duty pan stands. Requires professional gas installation and dedicated electrics on wall. Air cooling system. Forced air convection: 0.74 kW/h. Front left: Ultra Rapid 3.5 kW. HOB4 burnersRear left: 1.75 kW. TypeFreestanding dual fuel range cooker. FuelDual fuel. Pan supportsCast iron. Safety featuresSafety gas valves. Batteries and other consumable goods. - Second: double glazed. Viewing window- Main: double glazed. Model Burghley BU93BL. Also known as: BU93BL. 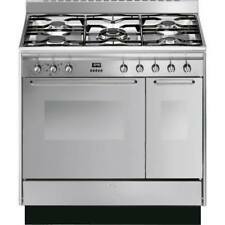 Type 90cm Dual Fuel Range Cooker. Oven Light Yes. Oven Type Grill. Oven Type Convection. Cast Iron Pan Supports Yes. Left: Scratch marks on the edge (see pictures ). Hardly Used. 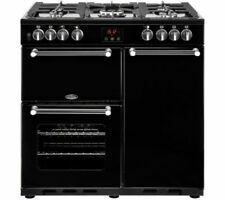 Type: Freestanding dual fuel range cooker. Oven type;. - Fully programmable main oven. Pan supports Cast iron. Fuel: Dual fuel. Hob type: Gas. Safety features; Safety gas valves. 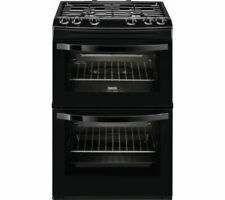 Type: Freestanding dual fuel range cooker. Oven type;. - Fully programmable main oven. Fuel: Dual fuel. Pan supports Cast iron. Hob type: Gas. Our experienced engineers refurbish these products and get them fully working again. With two ovens, a grill, seven hobs and a wok burner to work with, you'll have plenty of room and flexibility to cook up a storm and dine in style with friends. Type Freestanding dual fuel range cooker. Finished in black it will create a stunning focal point in your kitchen. Powerful 150mm outlet Cooker Hood by Cookology. Cast Iron Pan Supports. Heavy duty cast iron pan stands. Gas hob with 4 burners. MAIN OVEN - TOP RIGHT7 functions Inc. Oven capacity: gross - 68 litres, net - 61 litres. Side opening oven door. Triple glazed oven door. AUXILIARY OVEN – LOWER LEFT. Oven capacity: gross - 41 litres, net - 36 litres. A cooker for the family. The separate grill is great for smaller dishes and lets you create that browning we all aim for on food. Flexible cooker with dedicated grill. TypeFreestanding dual fuel range cooker. TypeFreestanding dual fuel range cooker. Oven type- Main: electric. Oven type- Main: fan. Pan supportsCast iron. FuelDual fuel. Safety featuresSafety gas valves. Minimum distance required750 mm. Viewing window- Main: double glazed. MAIN OVEN - TOP RIGHT. Oven capacity: gross - 68 litres, net - 63 litres. Side opening oven door. Triple glazed oven door. AUXILARY OVEN – LOWER. Oven capacity: gross - 41 litres, net - 36 litres. GAS HOB TOP. Finished in black it will create a stunning focal point in your kitchen. The hob is automatic electronic ignition and has heavy duty cast iron pan stands. Colour: Black. It has 2 cavities to choose from, including a main fan oven which circulates heat so your food cooks evenly on every shelf. This also has a handy grill setting, so you can easily put the finishing touches to your lasagne. Overall is good & clean mint working condition with manufacturers warranty. 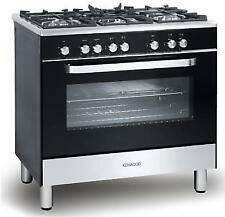 OVERVIEWTypeFreestanding dual fuel range cookerColourBlackFuelDual fuelLPG optionYes. (Programmable main oven. A) Of course! You can choose from different ranges of makes, sizes and models! A) All of our products are NEW they have never been used on even switched on! Unlike others, we buy in bulk therefore we can pass these savings on to you! SAVE £50 WHEN YOU SPEND OVER £500+! (A) Of course! You can choose from different ranges of makes, sizes and models! A) All of our products are NEW they have never been used on even switched on! Unlike others, we buy in bulk therefore we can pass these savings on to you! It boasts three spacious cavities, two ovens and a variable grill, which makes it a great choice for busy family households. The cooker boasts a generous five burner gas hob with sturdy cast iron supports to keep all your pots and pans in place. Oven capacity: gross - 68 litres, net - 61 litres. Second Oven. Heavy duty cast iron pan stands. 4 Gas burners. Removable inner door glass. Getting the Right Products for You Each and every order you place is checked by one of our experienced sales team. 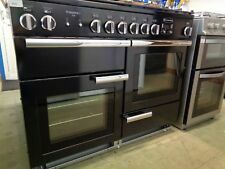 (TypeFreestanding dual fuel range cooker. Oven type- Main: electric. A) Of course! You can choose from different range of makes, sizes and models! Oven type- Main: multifunction. FuelDual fuel. A) All of our products are NEW! TypeFreestanding dual fuel range cooker. Oven type- Main: electric. Oven type- Main: multifunction. Pan supportsCast iron. FuelDual fuel. Minimum distance required50 mm to the sides. - Vapour clean. Number of burners7. With two ovens, a grill, seven hobs and a wok burner to work with, you'll have plenty of room and flexibility to cook up a storm and dine in style with friends. • Bundle up and save! Width: 110 cm. The two 61 litre ovens give you the option to cook food at different temperatures, the hob's ideal for juggling multiple pots and pans at once, and the grill's great for adding that crispiness we all love to our favourite recipes. The separate grill is great for smaller dishes and lets you create that browning we all aim for on food. TypeFreestanding dual fuel range cooker. Near to impossible to see on highlky polished black gloss. With two ovens, a grill, seven hobs and a wok burner to work with, you'll have plenty of room and flexibility to cook up a storm and dine in style with friends. TypeFreestanding dual fuel range cooker. Model TR62BL. Type Dual Fuel Cooker. Heavy Duty Cast Iron Pan Stands Yes. Glass Lid No. Removable Inner Door Glass Yes. TOP CAVITY There are number of reasons that a product may be graded:-. Why this Product is Graded. TypeFreestanding dual fuel range cooker. Oven type- Main: electric. Oven type- Main: fan. Pan supportsCast iron. FuelDual fuel. Safety featuresSafety gas valves. Secondly all products carry their manufacturer’s warranty which will be a minimum of a year unless stated otherwise.